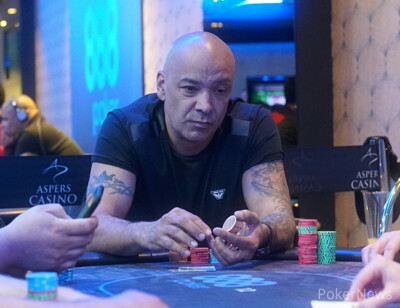 The winner of the 888Live Easter Edition at Aspers Casino Stratford is Krzystof Pregowski who took home £21,118 after a three-handed deal between him, runner-up Terry Jordon and Ciprian Paunescu. He beat a field of 303 entrants to take home the title and the trophy, and in doing so stopped Jordon from becoming the first ever two-time winner of an 888Live event. 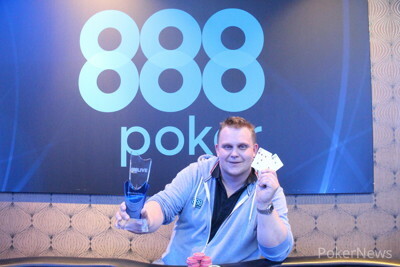 Pregowski's previous highest finish in an 888Live event was 12th just over one year ago for £1,670, but after the deal he was taking a much larger amount home, along with the coveted 888 trophy. The day started quickly, with eight bust-outs before the first break. Among the eliminations was Maria Kozak, the best-placed woman in the field, who exited in 15th place (£1,580), 888Poker Ambassador Chris Moorman (13th place - £1,580), and Julian Hazelhof (11th place - £1,930) whose overpair was no good against the set of Terry Jordon. All the while, Jordon was building up pressure. Such was his dominance at the tables, that at the final table he had just under half the chips in play and over four-times as many as his nearest opponent. As the final table got underway, it looked like Jordon might start to crumble. Some well timed bets from both Pregowski and Robert Lim looked like he might relinquish his chip lead, but he held it up until heads-up play began. 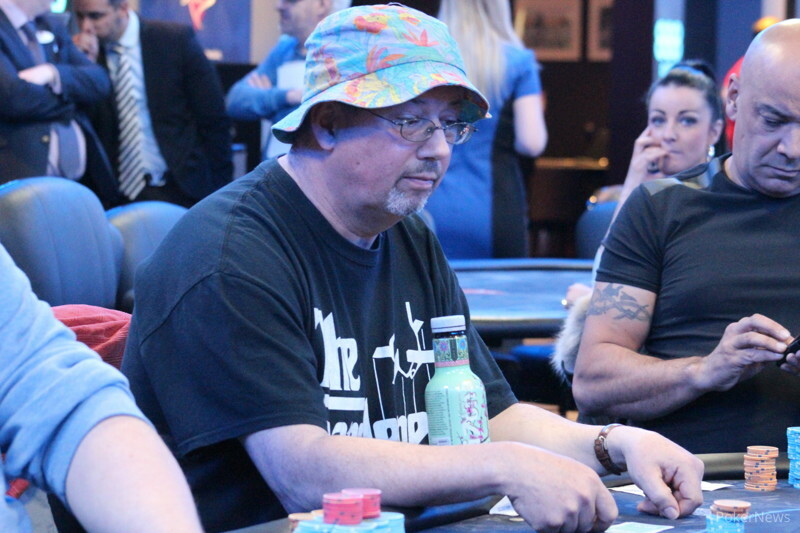 888 Qualifier Mark Harding had a good run to finish in 5th place (£6,645). Harding managed to turn a $12 qualifier seat into a deep run, only to be eliminated by Jordon when Harding held an inferior straight to his opponent. By the time play was three-handed, Jordon had built up an even bigger chip lead. By the time the question of a deal arose, he held over 5,000,000 in chips, compared to the sub-2,000,000 chip stacks of both his opponents. After the deal, it took some time for Paunescu's pocket nines to be cracked by the Ace-Queen of Pregowski to finish in 3rd (£15,000), and then the fun began. Over four enthralling and entertaining hands, the chip lead switched back and forth three times over three blind all-ins between Pregowski and Jordon, before Pregowski's Five-Deuce got the better of Jordon's Ten-Four, and Pregowski took down the tournament. 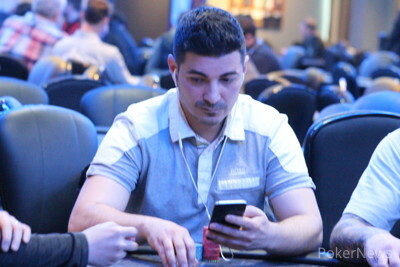 Speaking after the tournament Pregowski told PokerNews that thankfully last night he had doubled up on the last hand to put him in a good position for today. "Coming into today I took the same approach I had taken all the way through the tournament. I don't worry about anyone else's stack, I just play my way, take it one step at a time." By the time it got to the final table and with Jordon holding the lion's share of chips in play, Pregowski was adamant of aiming for first place. "I'm playing my cards not his cards. Whatever will happen will happen. Me and Terry [Jordon] have played together on a number of occasions. The deal seemed like a sensible thing to do. We all played hard, we all played well." The final hands seemed like a bit of a coin-flip, but Pregowski believes it was more about entertainment than the money. "The whole idea behind it was that every tournament when you come to heads-up, everyone sits there all serious for hours and hours. Someone mentioned earlier that a tournament took ten hours heads-up before it finished. "So we thought we'd just give it a spin and see what happens. Let the cards decide, not the players, and that's what we've done!" The players were all in before the cards were even dealt for the fourth time in a row, this time with Krzystof Pregowski holding and Terry Jordon . There was a pair of Pregowski on a flop, and although Jordon picked up outs on the turn, the river was the and Jordon was eliminated. He took home £21,000 for his efforts after the three-handed deal. In a mirror image of the hand before, Terry Jordon announced that he was all in before any cards had been dealt, and Krzystof Pregowski called. The board ran out and for the third time in three hands, and after three blind all-ins, the chiplead changed hands. On the second hand, before the cards were even dealt, Krzystof Pregowski announced that he was all in. Terry Jordon called. The cards were dealt and Pregowski turned over while Jordon held . The flop came giving Pregowski the chance to end the match, but the turn was the and the river the giving Jordon the double up. In a peculiar turn of events both Krzystof Pregowski and Terry Jordon agreed to go all in blind on the first hand of heads-up play. "I'm using my one-time," said Pregowski, as he flopped a pair on . The turn was the and the river the giving Pregowski the double up. Krzystof Pregowski moved all in for 1,385,000 from the button. Terry Jordon folded and Ciprian Paunescu called. The board ran out giving Pregowski the double up and leaving Paunescu with 90,000. The very next hand Paunescu got the chips in the middle with Paunescu holding against Pregowski's . The board ran out giving Pregowski a flush and eliminating his opponent. Terry Jordan raised to 170,000 from the small blind and Ciprian Paunescu called in the big blind. The flop came and Jordon continued for 200,000. Paunescu called. "I check to see what you got," said Jordon, "In case you've got a flush draw"
Paunescu moved all in and Jordon folded, but not before showing the to his opponent.